This week’s edition of TNA’s Impact Wrestling was the go-home edition for this Sunday’s Slammiversary pay-per-view and as a whole the show did its job well, pushing the major storylines going into the show and providing some good in ring action. In my opinion, the AJ Styles storyline (okay, let’s forget about the whole Clare Lynch saga and never mention it again) has been one of the best things about TNA and wrestling as a whole over the last year or so. It’s clear that TNA’s long term booking strategy is beginning to pay off, as I’ve genuinely been interested where the storyline has been going from week to week. 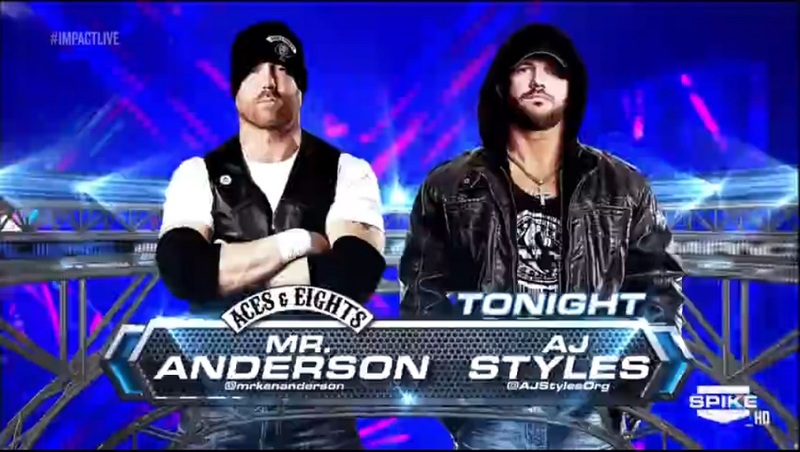 This match was set up at the start of the show, with Aces and Eights President and World Heavyweight Champion Bully Ray telling Anderson that he would have to face Styles tonight, because of Anderson being the one who failed to get Styles to join the group the previous week. A comment from outcast member D’Lo Brown, leading to vicious beat down from Anderson, seemingly removing Brown from the group for good. For me, this was fantastic decision as Brown neither fitted with the group nor brought anything to it. However I wouldn’t be surprised to see Brown appear in some fashion at Slammiversary. As expected of these two top draw talents the match was an impressive television main event of arguably pay-per-view quality. It seems The Phenomenal One has changed up his in-ring style as of late becoming more of a hard hitting brawler than the highflyer we’ve come to expect over recent years, however this style suits the storyline with AJ not looking to please anyone and simply win matches. There was a nice spot on the apron with Anderson delivering a DDT, which Styles sold to perfection. With Anderson returning Styles’ blows and the match going back and forth throughout this was steadily building into an exciting contest, until Kurt Angle came to ruin the party. It was frustrating to see the match end this way, although with Slammiversary just around the corner I can see why TNA opted for the Angle run. With Styles and Angle battling it out, it didn’t take long for Aces and Eights to make an appearance beating on both men. Their threat was countered by run ins from Samoa Joe, Magnus, Joseph Park and Sting. This allowed Angle and Styles to continue their battle up the entrance ramp, building well for Sunday’s contest. Personally, I would have preferred TNA to hold off on AJ Styles’s in ring return until Slammiversary, with his previous bout with James Storm and now this contest with Anderson somewhat taking the shine and draw of his match with Kurt Angle. The other big match on the show was used to hype two title matches for this Sunday and saw the return of one of the most successful tag teams of all time, Team 3D. Before the contest, Bully Ray was handed a microphone. Now anyone who’s been watching TNA over the last few years will know anytime Bully Ray has a microphone in his hand you better be listening and this promo was no different. He put over his number one contender, Sting, talking about people Sting had beaten to win World titles in the past, mentioning Ric Flair, Hulk Hogan, Kurt Angle and Jeff Hardy. Ray said he couldn’t wait to make sure Sting could never wrestle for the World Title ever again, before calling out Sting and Park to start the contest. I have to be honest, I didn’t hold out much hope for this tag team contest, as I’m not particularly looking forward to either singles contests on the Pay-Per-View. However, this was a surprisingly fun tag team bout, with the opening of the match being a brawl on the outside, leading to a nice double clothesline spot from Sting and Bully once back on the inside. With Team 3D working over Park for the majority of the match, Sting was heavily protected with only a small amount of ring time after Park made the hot tag, which is worrying considering he’s in a big singles main event on Sunday. Sting looked strong once the hot tag was in, hitting a double Stinger splash and putting Devon in the Scorpion Death Lock, only for Joseph Park’s “inexperience” to cost the team as he failed in his attempt to put Bully Ray in a similar move, leading to a silly spot with Park falling into Sting. Although Park plays the character well and it has been entertaining to watch since its debut, I’m definitely chomping at the bit to see him return to playing Abyss full time once more. It looks like my wish might be granted, as just as 3D looked to be heading for victory, Abyss’ music played distracting Bully and Devon and allowing The Stinger to hit a Scorpion Death Drop on Devon for the win. Although this match will probably not be remember for long, it did a good job of building these two matches heading into the pay-per-view. The Bully Ray storyline continued later in the show, with a backstage segment between Hulk and Brooke Hogan as they discussed Ray’s words from last week about “still loving” Brooke. I could really do without so much Hogan on the product, I’m tuning in to watch pro wrestling, not a continuation of Hogan Knows Best. There’s definitely way too much going on in the Bully Ray-Sting match at Slammiversary, and I’d expect Hulk, Brooke, Aces and Eights and maybe even Abyss to get involved in some way, especially seeing as I can’t see Sting wrestling a full main event match. Sting and Bully Ray returned to end the show with the usual mass brawl, with both men trading blows, until Devon re-entered and Sting got flattened with a 3D. This is the strongest Aces and Eights have looked for a while, maybe TNA has taken notice of WWE’s booking of similar group The Shield. Another big match heading into Slammiversary is the Four Way Elimination match for the World Tag Team Championships. James Storm explained why he’d chosen Gunner as his Tag Team partner in a backstage segment. Storm is usually spot on with his promos, however this one about Gunner “killing people” and how he was going to “kill people for me (Storm) too” was awkward and sat uneasy in the current climate. There was a nice preview to Sunday’s tag title contest with an Eight Man Tag Team match, featuring Champions Chavo Guerrero and Hernandez teaming with Gunner and James Storm to take on Bad Influence and the poorly name Dirty Heels. With all eight men working hard throughout the previous weeks and months to build the psychology going into the big elimination match, this contest turned it up to eleven. 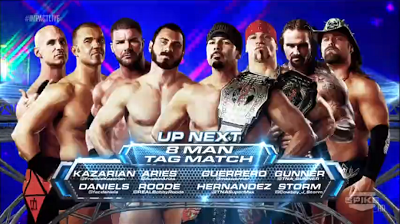 With Austin Aries working the crowd to perfection, tagging in Bobby Roode as soon as his name got chanted. There was some nice teamwork from both heel teams with a slingshot/elbow combination from Roode & Aries amongst the highlight. Cleverly, we didn’t get to see much of Storm and Gunner as a team until the very end of the contest, when Gunner entered and destroyed the competition, eventually making Aries tap out to a torture rack. With all the elements going into the Four Way at Slammiversary it will be very interesting to see who comes out with the Tag Team Titles. New Knockout Champion Mickie James edged closer to a heel turn, with an interesting promo both praising and criticising her fans base. Mickie went on to call out former champion Velvet Sky and praise her as well, albeit in a patronising manner. Even going as far as to back out of a rematch with Sky at Slammiversary. Mickie hasn’t quite nailed this new character change yet, however it has been a while since she played a heel character, all the way back to her debut in WWE, and it will take time for her to settle into the role. Gail Kim interrupted the pair to put herself forward for a title shot, attacking Velvet Sky and attempting to place her in the Figure Four Leg Lock around the ring post we’ve seen take out numerous opponents in recent weeks, only for Taryn Terrell to run in for the save, leading into the Mixed Tag Team contest. Chris Sabin teamed with Terrell, whilst Kim was joined by X-Division Champion Kenny King. I would have much rather Terrell have stayed as a referee as she’s not quite as talented or entertaining as ODB who has been relegated into this role, and has done little more than catfight with Gail Kim, which doesn’t give much hope for their Last Woman Standing Match on Sunday. Sabin and King carried most of the contest with some solid high flying action, finishing with Sabin’s new finishing move, the impressive Hail Sabin. With Sabin cutting a pre-match promo about his return and the Slammiversary match, the Pretty Boy Pit-bull made the attack from behind, only for Suicide to make the save. For me, this match doesn’t really need Suicide as the story between Sabin and King should be strong enough to build a singles match around, which is one of the downfalls of the new X Division format. However, I’m sure the Three Way Ultimate X contest will be a great spectacle with this three talented individuals. Hopefully, Sabin remains fit and strong for a long time to come, as he still has a lot to offer TNA. We also got a rare appearance from TNA President Dixie Carter, who came to ring to make announce they would reveal a new TNA Hall of Fame Inductee at Slammiversary, although she felt a bit like a Mom giving a speech at a child’s birthday party. She was interrupted by Aces and Eights members Garrett Bischoff, Wes Brisco and DOC. Bischoff cut a decent promo, helped by the fact that it’s very easy to dislike him! With Aces and Eights circling Dixie, Magnus and a returning Samoa Joe. Joe’s intensity on the mic is impressive as always as he challenged Garett to a match. With Joe dominating it didn’t take long for Aces and Eights to get involved tripping Joe, before Magnus attempted to even the odds. With three-on-one on Magnus, Aces and Eight were looking strong, until Joe hit a huge suicide dive, taking out all three members. Joe launched into another charismatic promo, calling the group cowards and revealing a new match for Slammiversary that will pit Brisco, Bischoff & DOC against Joe, Magnus and a returning Jeff Hardy. This could be an interesting contest and will clearly get compared to similar six man tag team matches that WWE is putting on at the moment with the Shield. However despite the talent on the TNA side of the team, I don’t think Brisco and Bischoff quite have the in ring experience to pull off a match anywhere near the quality of the competition. What have we learnt from this weeks Impact Wrestling? 3. Hulk Hogan appears almost as much on Impact as the WWE App does on Raw!